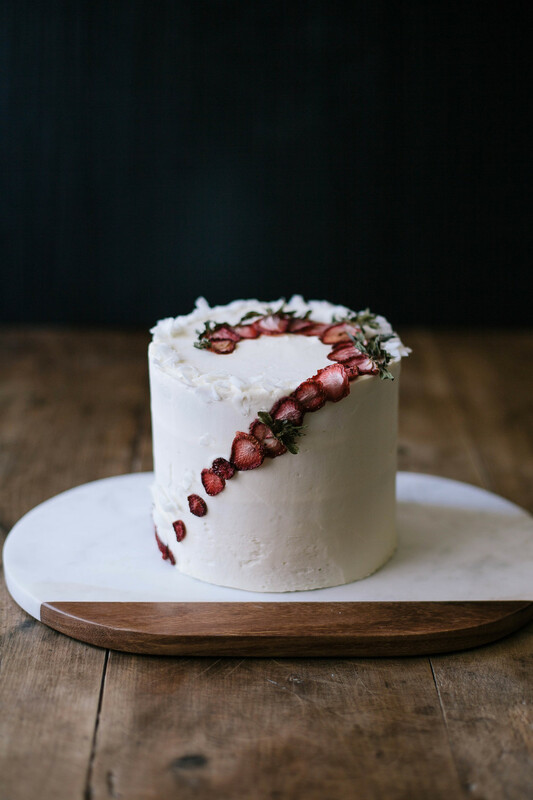 Strawberry Coconut Cake — always with butter. Oven 325 F. Butter and flour two 6x3" cake pans. In a large bowl, whisk the flour, sugar baking powder and salt to combine. Set aside. In another bowl, whisk the oil, puree, vanilla and eggs to combine. While whisking the dry bowl, slowing pour in the wet ingredients. Whisk until just combined and there are no lumps. Divide evenly between the two pans. Bake for 45 minutes - 1 hour, until the top springs back. Run a knife around the edge of the pans to make sure it didn't stick anywhere. Then invert both cakes onto a wire rack and let cool completely. 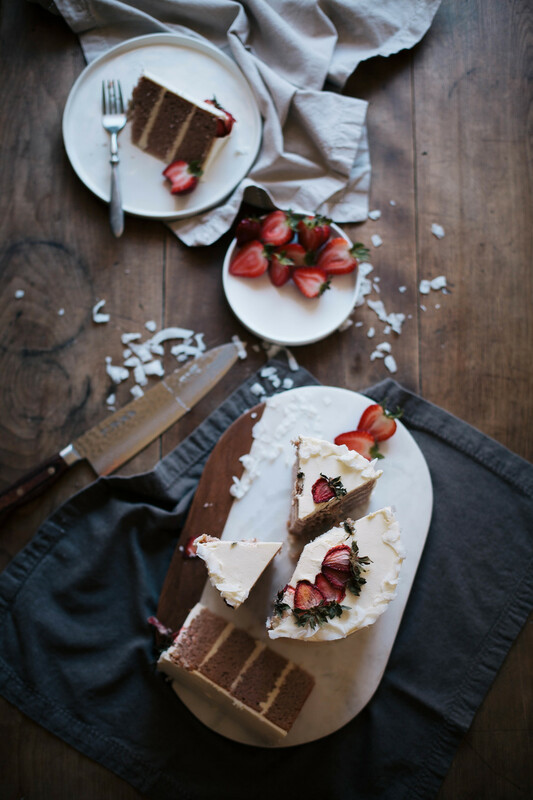 Once cool, cut off the top of the cake if it has domed while baking, to make it completely flat. Then divide in half. Repeat with the other cake so that you now have 4 layers. *to make reduced coconut milk. Bring one can of coconut milk to boil in a large saucepan over medium high heat. Reduce to medium low, then continue to boil until it has reduced to about half it's volume. Then remove from heat, transfer to a bowl and place in fridge until it's completely cool. In the bowl of a stand mixer, combine the butter, powdered sugar and salt. Start to mix with the whisk attachment. Drizzle in the reduced coconut milk. Then mix on high until it becomes light and fluffy. You may need to add more or less milk. You want it to be very fluffy, but not too soft where it won't hold up in the cake. Oven as low as it will go. Baking sheet lined with parchment or a silpat. Cut the strawberries into very thin sliced, leaving the steams on. Evenly place on your baking sheet. Let dry out in the oven until they are crisp. Mine took about 3 hours. Let cool completely them removed from the baking sheet. I had to look online for quite a while to find a good strawberry cake recipe. Everything called for box mix and jello powder. 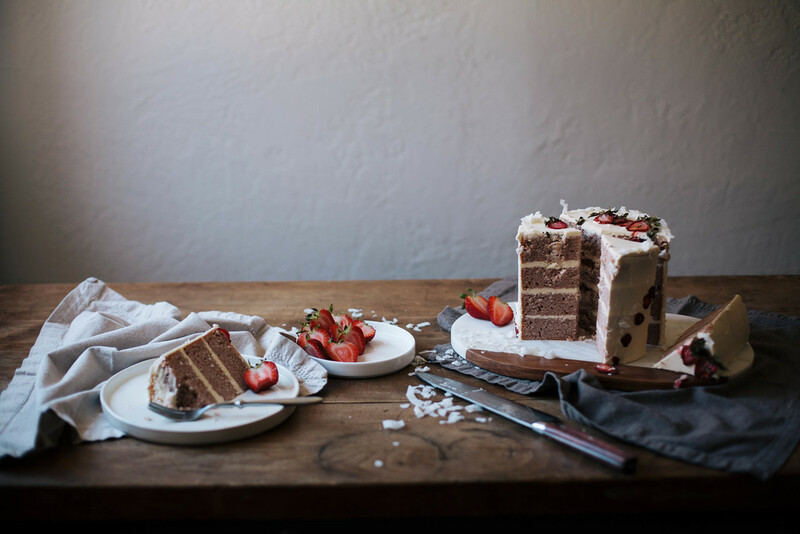 It's summer, there are amazing strawberries at the store, and there is rarely a real strawberry cake recipe to find? I didn't have one in my repertoire and couldn't find one in any of my cookbooks. So my search on the internet continued and I finally found this one. The girl who posted it had the same problem as me. She didn't want to use that powder stuff. So glad she posted this one. It tastes truly of strawberries. The cake might not be as pink as the jello mix ones but it definitely tastes better. You can totally add food coloring if you want to make it a more vibrant color but I preferred it the colors that the strawberries were. The frosting has a light taste of coconut that I really liked with the strawberry. I am still slightly obsessed with tropical flavors, coconut, dragon fruit, passion fruit... So I immediately went to one of those for the frosting. They remind me of going to Hawaii, which in this heat, is all I can think about. Planning imaginary vacations in my head, even those they are far out of my budget at the moment.